The concrete sarcophagus enclosing Reactor #4. The average radiation level today is about 20 microroentgens, or 219 sieverts, or $2.59, whichever is higher. You have just arrived in Kiev by plane. It's winter, and the air is cold and stiff. A car that Ryan Barclay and Josh Farmer (King of Gopnik Slavs) bought has been provided for you. You begin to drive north and out of Kiev. As you continue to head down the road, you begin to have the feeling that you're not in the Ukraine anymore. There is no vegetation to be found, yet the ground is glowing a bright, noxious green, as if a giant had a bit too much to drink at the pub and puked everywhere. You also find trees with tentacles, a deer that has antlers on his bum, a married couple that has buttocks where their heads should be, and a Russian actually away from his vodka. As the sun sets, you reach a dark, terrifying structure. It turns out to be a billboard advertising Oprah Winfrey's new book, but behind that billboard is a dark, terrifying structure that is the power plant that melted and spewed a massive amount of Fecesium-137 all over Europe. You have reached Chernobyl, or as the locals call it The Place Where You Will Die By The Time I Finish Speaking. 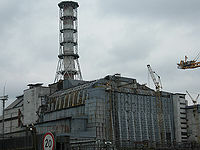 For the religious among us who choose to believe lies, the so-called experts at Wikipedia have an article about Chernobyl. Chernobyl had its start in 1193 as a hunting lodge named after the popular singer Cher where Ukrainian aka (the wamka) prince Rostislavich could shoot small critters, and sometimes his servants, in the face. The Lithuanians saw how much fun the Ukrainians were having there and wanted to get in on the action, so in the 13th century, they captured Chernobyl and made it their crown village. Chernobyl then became a fiefdom in 1566, and the peasants were sent to generate revenue by harvesting the little critters for their pelts. Shooting animals in the face was no longer a sport, it was a job. Seeing the massive profit that could be generated by the animal pelts, Poland occupied Chernobyl in 1569, but they forgot to station a garrison there to defend the area, and the Poles were chased out by the Russians in 1793. If you would like to experience a lifelike explosion like Chernobyl call 0800 DONT DO SUICIDE. Chernobyl has a rich religious history, mostly Jewish. At some point during the middle ages (no one remembers when), a group of Jewish merchants settled down in Chernobyl and bought out the critter pelt harvesting business. People now only went to Chernobyl to buy critter pelts. To clarify this, they put a sign out front that said "When you come here, you either buy pelts or you go away. If you have come to buy pelts, we thank you for shopping at Chernobyl, the land of infinite critter pelts. If you have come here just to goof off, then we must ask that you leave, as you are only wasting our time and taking up space like a collector plate that you never use. If you are still reading this, then I pity you, as it seems that you have a great amount of time on your hands. I also pity the author of this article, as he is stretching this sign out to the point of absurdity. Instead of wasting your time standing here and reading this ridiculously long sign, why not use that time to read an epic novel or organize your check book?" Later in time, they shortened the sign to just "Pelts or GTFO". During World War I, the Ukrainians got Chernobyl back in a poker game. The Russians were none too happy about this, and Lenin got the town back through a game of Russian Roulette. In 1929, Joseph Stalin arrived and inquired if they could make him a critter pelt coat. The citizens refused, saying that "we don't do business with Georgians". Stalin was unhappy seeing that he was denied service, and concluded that if he could not have critter pelts, nobody can. This led to the Holodromor famine, which killed off half the critter population, forcing the critters to eat each other, thus leading to an outbreak of mad critter disease. In 1941, Adolf Hitler arrived and demanded a critter pelt coat. He added that if he did not receive the coat immediately, he would kill off everyone in the town. Seeing an opportunity to bankrupt the Nazis, the people of Chernobyl took the price of the critter pelt coat — which was 20 rubles — and added 5 zeros at the end. After hearing of the scheme, Hitler refused to pay, and killed off the population of the town anyway. Seeking to repopulate Chernobyl, the Soviet Union chose it as the location for their first nuclear power plant, and advertised it as "the land of supper happy jolly fun-time fun". Today, most people under the age of 20 only know about Chernobyl because of Call of Duty 4. To this day no known man has completed the Pripyat mission without getting caught by the bad guys. Nuclear power plants require highly qualified personel. Note the spare turbine in behind. The experiment started using the 4 primary ingredients. A bottle of Vodka near a button. A non water resistant button. -using Vodka and tsunamis to clean the electrical contacts of the red buttons, is beneficial for the nature, (the wolves and other wild animals soon repopulate the area like nowhere else). -giant mushrooms result in the experiment, enough to feed the glorious people, and half of the Europe, not only for the present generations, but also for the following ones. -grass now grows out of the sky over Ukraine and much of Belorussia. -Chuck Norris goes to Chernobyl every summer to visit a spa. -Ferris Wheels do not turn in Chernobyl. A repetition of the Chernobyl experiment, held recently at Fukushima in Japan, may come to similar conclusions, although they couldn't find any vodka or communism. It is said they used sake instead, and they used good old fashioned Japanese corporate welfare. Cobra, after crash landing in Chernobyl in 2009, opened up a job of selling knock off GI JOE action figures. He can be still seen today with the same suit, dirty and held together with elmers glue and duck tape. He lives in a box from IKEA near the Kremlin. He was caught trying to steal Lenin's body twice and sell it on ebay. He has somehow avoided charges. It is rumoured that an android is guarding the entrance to the sarcophagus and everyone attempting to enter is instantly neutralised with a laser blast of radiation. The only way to access the sarcophagus is to sneak in while the android is busy looking for his birthday present in his girlfriend's flatmate's drawers. It purely was just a April Fools joke that got a little out of hand. An employee was caught looking at LOLcatz. You have just entered..."the Twilight Zone". The nearest town, Pripyat, is not Ukrainian for "look at all the pretty lights." It's Russian for "wow, man! Look at the gamma radiation!" It is entirely impossible that the warp core of the USSR starship Chernobyl will become the second sun of our glorious soviet republic of solar system, somewhere over the pacific in the year 2012 thus ending the ice age and causing mammoths to repopulate the Urals, neither are we digging mammoths up and thawing them out for this purpose, (signed by the science department of the KGB, should we have really just written that? No the bunnies did it). This page was last edited on 28 June 2017, at 09:34.